Dear Readers, Happy mid-year! Hope the first half of 2017 have been a stunning ride for you. We at Lighting Today are looking mighty forward to the upcoming light shows that will be gracing our shores for the latter half of the year. Do come say hi at our booth at both BERX Asia 2017 and LED + Light Asia 2017! 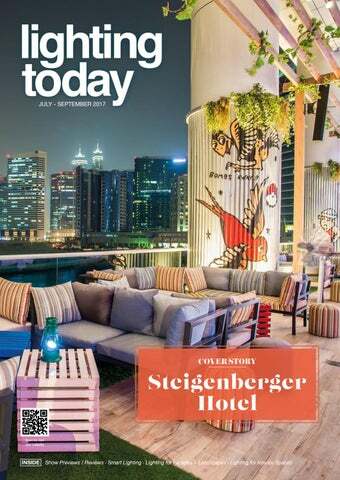 Our cover story features the impeccable Steigenberger Hotel at the Business Bay District in Dubai. Situated in Dubai’s Business Bay District, this cosmopolitan hotel with a German touch is the first property from the Deutsche Hospitality brand in the GCC region. Featuring elegant and classy designs with aristocratic ambience, the newly opened 5-star Hotel meets the demands of leisure combined with German precision and efficiency. The pride and joy of the hotel rests on its rooftop balcony, aptly named The Backyard. Intrigued? Take a read! For facades and landscapes, our choice piece features a spectucular lighting installation by L&E for the Kian Un Keng Shrine. The lighting design at this area is done by using red color, which is an auspicious color from Chinese beliefs to cover up the shrine. Red conveys light, warmth, strength and glory, while the dragon sculpture is lit with white light to stand out as the Chinese considers that dragon is a symbol of strength, power and mightiness. Read on to find out more about this ambitious project. Spatial envelopes shines a spotlight on Vossloh-Schwabe’s newest illumination project for the Helly Hensen brand store. Interalighting developed a track light Optima ORIGI LED 38 W, using a Vossloh-Schwabe LED module and control device (LED driver). Stable luminous flux and a five-year warranty, high colour rendering index, a large luminious efficiency and reliable components. All this makes this the track light the optimum choice for shop lighting. Hop over to learn more about this technical piece. Have something lighting-related you think we would love? Send them in! We welcome submissions and would be happy to feature pieces from loyal readers as long as it fits snugly into our theme. To end off, we wish you a graceful stroke into the finishing pastures of 2017.
lights switched off is a problem. Smart lighting systems in interiors involve can involve simple functions such as auto-adjusting lighting levels to depending available ambient daylight or presence detection. In more sophisticated smart systems we find integration of all kinds of sensors, GPS and LiFi that are linked to apps allowing direct and dynamic interaction with the occupants of the space providing site/ product information, helping with way finding or guide in case of emergencies. But these systems also offer monitoring options about the performance of the lighting system or feedback on system failures with the opportunity to act and adjust quickly. Pilot projects are under way in several retail / department stores around the world as well as some underground metro stations like in Paris. In extriors we see the introduction of smart wireless systems in many cities around the world who have adopted a “smart city” approach. We find particularly the big manufacturers heavily involved by offering “free” test installations on stretches of roads to wet the appetite. Though many of these installations seem to be “politically motivated” and not necessarily cost efficient at first, they do appeal to the general public. Tthere are definitely lots of merrits to smart city lighting strategies, specifically the development of smart poles that integrate many more functions then lighting alone. Linked to a smart grid, these poles may have photo-cells, light or proximity sensors to regulate lighting levels (dimming) or provide on-demand lighting. Proximity sensorswithin a wireless network may regulate lighting when cars or pedestrians are approaching. At the same time the smart features provide real time tracking of energy consumption, lighting failure monitioring and may also be used to monitor traffic flow. For me lighting design isn’t pure lighting design anymore…you need to be realy “smart” these days to be able to coop with lighting design version 2.0.17! R R U U O O Y Y D N I F I F F O O N N K O C I O I T A T L EGRRA A . G . G T EURBBIIN NG N T IIN T R S U IIST D D 26 – 28 July 2017 Singapore Marina Bay Sands Expo & Convention Centre iExperience of Tomorrow – a SMART Hospitality and SMART Corporate Experience iExperience of Tomorrow – a SMART Hospitality and SMART Corporate Experience For the first time, walk-through a live mock-up of a fully integrated hospitality and corporate setting at the For the first time, walk-through a live mock-up of benefits a fully “iExperience of Tomorrow” showcase to feel the integrated hospitality corporate Touch settingdown at theat“iExperience of automation for yourand organisation. the of Tomorrow” showcase feel the benefitsguest of automation exhibition, check-in with to your personalised for your organisation. Touch down at theand exhibition, check-in with concierge, immerse yourself in content a hotel room your personalised guest concierge, based on your preferences, control aimmerse meetingyourself with thein content and a hotel room based on your your experience preferences,with control a meeting touch of a button, and end a drink. with the touch of a button, and end your experience with a drink. Register Register your your visit visit or or find find out out more more at at www.systems-expo.com. www.systems-expo.com. For For enquiries, enquiries, email email marketing3@giec.biz. marketing3@giec.biz. ood visitor response to Prolight + Sound: following the record set last year, the International Fair of Technologies and Services for Entertainment, Integrated Systems and Creation once again registered a slight increase in the number of participants. From 4 to 7 April 2017, the fair welcomed 45,100 visitors from 139 countries. 950 exhibitors from 39 countries presented their latest products for the fields of lighting, sound and stage engineering, broadcasting and production technology, systems integration and AV media technology. “In many important international markets, demand for live entertainment has increased significantly, as has the number of elaborate corporate and customer events being held. Investments in modern event technology are being made all around the world and, as the international platform for the industry’s innovations, Prolight + Sound benefited from this positive business climate. Once again, the fair demonstrated how important it is for the individual segments of the event and media-technology sector to exhibit, network and exchange information together at the same time and place”, explains Michael Biwer, Group Show Director of the ‘Entertainment, Media & Creative Industries’ Business Unit of Messe Frankfurt Exhibition GmbH. pad: “We develop our products with the dates of the fair in mind and begin production shortly thereafter. In our case specifically and for the lighting segment in general, business at Prolight + Sound has developed very well. It is also very good to see how the visitor level has reached an even higher standard of professionalism.” This year, too, the fair was distinguished by its extremely balanced visitor structure, as noted by Marko Kraft, Sales Manager of Salzbrenner Media: “At Prolight + Sound, we reach exactly the people we need because, as a rule, our customers are a mixture of technical directors, sound engineers and planners who take the buying decisions for their individual fields.” Conference programme and new formats strike the sector’s nerve Against the background of technical progress, increasing expectations on productions and new legal requirements, on-going professional development is of great importance for everyone in the event sector. W ith the ‘Prolight + Sound Conference’ and the ‘Eventplaza Conference’, the fair was characterised by an extensive programme with more than 70 lectures, seminars and panel discussions. Many of them were held in English and over 2,600 visitors took advantage of this opportunity, an increase of around 40 percent compared to last year. Additionally, Prolight + Sound was supplemented by several new event areas. For example, the ‘Silent Stage’ gave visitors the chance to learn about this new concept. Thus, event engineers and musicians could see how this innovative stage setup, which is designed to minimise noise levels on the stage, can contribute to improvements not only in the mix but also in the performance of musical acts. Numerous brands, including renowned manufacturers of inear monitoring, presented their solutions at this area: “The visitor response was very good and, for us as exhibitors, the plan was a complete success”, said Markus Ganzmann, KLANG:technologies GmbH. “We wanted to demonstrate the advantages of the silent-stage concept for visitors and present our products under realistic conditions. For this reason, we initiated the ‘Silent Stage’ area together with Messe Frankfurt and other companies and played a key role in its conception and implementation”, said Johannes Steger, Vision Ears. Another première at Prolight + Sound was the ‘Faces behind the Voices’ multi-media exhibition, which introduced Germany’s best-known dubbing actors and put the spotlight on professional dubbing production as part of the entertainment business. Following its successful debut last year, ‘DJCon’ was held again at Prolight + Sound 2017. There, disk jockeys had the opportunity to find out about new products, attend lectures and workshops on DJing and DJ equipment and see some of their top colleagues in action. As in the past, this year’s Prolight + Sound was the venue for the presentation of several important awards. Thus, the Opus – German Stage Award was given for two projects: the winner in the ‘Stage and Lighting Design’ category was Rea Garvey’s ‘Get Loud Open Air Tour 2016’; in the ‘Technical Realisation’ category, the award was given for Ulrich Rasche’s production of Schiller’s ‘The Robbers’ at the ‘Residenztheater’ in Munich. The media installation at the head offices of Hilti AG in Liechtenstein was honoured with the Sinus – Systems Integration Award. For the first time, Prolight + Sound was also the setting for the presentation of the ‘Mondo*Dr’ Award, which spotlights outstanding permanent-installation products in several categories. Strong trade-fair duo with valuable synergistic effects for the music and event sector This year, Prolight + Sound was held concurrently with Musikmesse, International Trade Fair for Musical Instruments, Sheet Music, Music Production and Music Business Connections, from Wednesday to Friday, a day longer than in 2016. This turned Frankfurt Fair and Exhibition Centre into a get-together for the entire music and event sector and attracted around 100,000 visitors from 144 countries. Altogether, 1,922 exhibitors from 55 countries made presentations there. The conceptual development of Musikmesse and Prolight + Sound will be continued in the future and, to this end, Messe Frankfurt is in close, continuous contact with the associations and companies from the sectors represented at the fair. For more information, visit www.prolight-sound.com. etailers, manufacturers, distributors, representatives of trade and industry and musicians and music fans from all over the world came together at Frankfurt Fair and Exhibition Centre from 5 to 8 April 2017. 56,700 visitors from 119 countries attended the event to discover the latest developments in the market, make contacts and participate in the extensive programme of events. “The musical-instrument market continues to be in a state of transition. We reacted to the changing circumstances with an optimised concept for the fair and are now continuing on this track. The echo from representatives of the various segments at the fair, as well as from our visitor and exhibitor polls, indicate a significant qualitative increase compared to last year. Moreover, we were able to reinforce the synergistic effects with Prolight + Sound by modifying the sequence of days. As expected, the discontinuation of the Musikmesse Sunday led to a decrease in the number of private visitors. Accordingly, one of our goals for the future will be to make visiting the fair more attractive for music aficionados on the Friday afternoon and Saturday. Overall, we draw a positive conclusion and will continue to work on a future-oriented trade and marketing platform in close cooperation with the exhibitors and associations”, says Michael Biwer, Group Show Director, ‘Entertainment, Media & Creative Industries’ at Messe Frankfurt Exhibition GmbH. 972 exhibitors presented their products to an international audience of visitors. After Germany, the top visitor nations included the Netherlands, Italy, France, Switzerland, Belgium, the United Kingdom, Austria, Poland, Sweden and China. Additionally, over 20,000 music fans attended the events of the Musikmesse Festival, an integral part of the Musikmesse concept, with concerts by over 50 national and international artists, including Extrabreit, Oleta Adams & hr-Bigband, T ill Brönner, Steve Stevens & Band, Branford Marsalis Quartet featuring Kurt Elling and many others, at venues throughout Frankfurt. MI associations see Musikmesse on the right track To increase value added for all groups of visitors, Musikmesse was supplemented by new attractions and an expanded complementary programme of events. Together with the Musikmesse Festival, the fair offered over 1,000 events, from concerts and live performances to workshops and masterclasses. The echo from the sector was positive: “The Society of Music Merchants (SOMM) welcomes the comprehensive and on-going restructuring initiated in 2016. Thanks to the new concept, I am confident that we will be able to achieve a great deal. Change is clearly in the air. For German, European and international companies, Musikmesse in combination with Prolight + Sound ranks among the most important tools for business-to-business communication”, said SOMM Director Daniel Sebastian Knöll. tremendous. This was my 19th Musikmesse and I can say that we have never had so many visitors to our stand. I appreciate these developments and hope that more major brands will decide to return to the fair in the future – after all, the visitors want to see these brands. I would say that everyone who wasn’t here this year has really missed something”, said Kai Böckmann, CEO, Trius Music, Orange brand distribution. Furthermore, the fair expanded its thematic spectrum to include subjects from the world of music therapy and teaching. For example, the German Music Therapy Society took part in Musikmesse for the first time and presented its ‘InstruMental Room’ where visitors could participate in interactive events, such as sound journeys and ‘DrumCircles’. At the new ‘Discover Music’ area, which was organised in cooperation with the Frankfurt Music Academy, visitors could explore the world of music making under expert supervision. “The children’s gleaming eyes spoke for themselves: with ‘Discover Music’, we have helped generate an enthusiasm for music making at an early age. And this was confirmed by both parents and teachers at the event”, said Stefan Zint of Frankfurt Music Academy. To improve the business quality of the fair, Messe Frankfurt implemented a variety of measures designed to cut noise levels. For example, there were acoustic curtains between the individual product groups and sound-proof cabins for testing instruments. As last year, Hall 11.1 was reserved for trade visitors only and provided the ideal setting for presentations by exhibitors with a business focus. This exhibition hall was also a magnet for the musical instrument trade thanks to the Business Academy inspired by SOMM with expert lectures especially for professionals from the sector. “This was our first time in the B2B Hall and it was very good for us. Our primary aim was to make contact with retailers. In the event, we spoke with business partners from all over the world and found exactly the right people for our business. Although we are well established in the sector, it is always good to make new contacts – and face-to-face meetings are significantly more effective than emails”, said Stephen W ick, CEO, Denis W ick Products. For the specialist retail trade, Musikmesse was an international get-together: “I found it very good that all important people were there despite several smaller exhibition stands. Hence, the trip to Frankfurt was worthwhile for me and I had one good discussion after the other at the fair. As a networking platform, Musikmesse is unbeatable”, said Günter Zierenberg, CEO, Musik Produktiv. Martin W iesenbauer, proprietor of Music World in Augsburg, confirmed the positive processes generated in the course of the reorientation: “The show continues to be an extremely important meeting point for our industry. This year, I got the impression that efforts are being made to create a magnetic effect with heroes, which still exist in our sector.” For more information, visit www.musikmesse.com. oherent will showcase several innovative solutions for packaging at Interpack 2017. The new StarPack CW Hybrid addresses needs current needs in roll-to-roll processing with industry-leading features to address a broad range of packaging applications, such as cross web and web direction scribing and perforating. StarPack CW Hybrid - flexible cross web and web direction solution for medium size production The StarPack CW Hybrid system covers the needs of medium size production for cross web and web direction processing. One or two lasers with up to eight 2-axis scanners allow any recipe of scribing in cross web direction and in web direction, as well as perforation of round micro-holes. Optomechanical improvements and StarFlex software makes for simplicity, convenience, speed, quality, and lower cost-of-operation. StarFlex - more flexible processing, shorter setup times StarFlex GUI software provides a unified user interface, no matter which type of system, whether web direction or cross web, perforation or scribing. The software operates systems with up to 9 lasers, and speeds layout changes. Process parameters can be changed and optimized without the need to stop the system. Further, StarFlex software offers four different operating levels for users, administrators etc., to prevent inadvertent errors or reprogramming. StarMap, VisionPerfoControl and LaserPulseDetection eliminate trial-and-error, and improve product quality StarMap, optimizes Modified Atmosphere Packaging (MAP) provides the best perforation recipe for various packaging designs and products, and eliminates trial-and-error. VisionPerfoControl is a unique real-time monitoring system for hole diameter and circularity. LaserPulseDetection dynamically monitors laser output, resulting in improved product quality. For more information, visit www.rofin.com. of the Elation lighting fixtures, there were a few in the rig he hadn’t yet had the opportunity to use. “This was the first time I got to use the Satura’s and ZFX Pros,” he stated. “I was super excited when programming with these fixtures because even though 7th Heaven is a rock band, we had to keep it tasteful to attract a large age group ranging from kids to senior citizens. These fixtures were a great choice for that.” Most of what Zach used in the Royal Theater was hung on the upstage and midstage truss but he also had beams in the corridors on stage left and right. He programmed and operated the shows using a provided Hog 4 with a wing. Zach said he enjoyed the experience and sends a special thank you to Jonathan Wormgoor, head of lighting for Harmony of the Seas’ Royal Theater, saying “He helped me get the show where it needed to be.” Harmony of the Seas first sailed in 2016 and is an environmentally friendly ‘smartship’ in which energy savings and energy efficiency take priority. Elation LED lighting systems can be found across the ship including in the Royal Theater, Studio B ice rink, Royal Promenade, AquaTheater, Boardwalk, FlowRider surf area, Solarium and pool area, as well as a host of onboard clubs, bars and lounges. For more information, visit www.elationlighting.com. apturing, transmitting and processing data lies at the heart of the fourth industrial revolution. Consequently, cutting-edge connectivity is a must for equipment in factories and similar environments – for example to enable predictive maintenance. At Hannover Messe 2017, Rittal is highlighting the communication capabilities of its new cooling units and chillers. And by presenting these in conjunction with Siemens MindSphere and IBM Watson IoT, the enterprise offers insight into tomorrow’s Industry 4.0 world. Rittal’s new Blue e+ cooling units and chillers consume an average of 70 per cent less power than their conventional counterparts. What’s more, they raise the bar in M2M communication. Specifically, they can transmit key data to a smartphone quickly and simply via a NFC (near field communication) connection. And RiDiag III parameterisation and diagnostics software uses a USB interface or a network to support efficient system operation, deliver rapid support for maintenance and repairs, and enable in-depth diagnostics. The new communications module (Com Modul) also allows the cooling units and chillers to communicate with any higher-level system via OPC UA, PROFINET, SNMP, Modbus RTU and CAN Master – enabling predictive maintenance, data analytics and more. Rittal is presenting two examples of these products in use at Hannover Messe 2017 (the industrial trade fair in Hanover). These highlight the potential of the Blue e+ range’s communication capabilities. The first use case shows how Rittal’s units interact with Siemens MindSphere. This cloud-based, open IoT (Internet of Things) operating system enables customers to develop their own Industry 4.0 applications. The platform is scalable, and can capture and analyse huge volumes of data – paving the way for smart-factory processes in energy data management and resource optimization, for example. Additionally, it harnesses analytics to predict when repairs and maintenance are required. This cuts costs and raises system uptime in comparison to work performed at predefined intervals. The solution also calculates the shortest routes for service engineers to take for these tasks – which can be particularly advantageous at facilities with a large number of machines. Plus, because up-to-theminute data on each unit is available on the IoT platform, staff know what replacement parts they will require for the job in hand, eliminating the need for multiple trips. The second use case examines how Rittal products interoperate with cloud-based data analytics system IBM Watson IoT. Watson’s architecture is designed to rapidly process information, and employs machine learning algorithms to analyse growing data volumes with increasing precision – with the aim of finding better answers to a variety of challenges. A machine at Rittal’s production plant in Rittershausen, Germany, is a prime example, demonstrating how this information is used to improve efficiency. These types of data analytics applications streamline maintenance and cut downtime – in other words, customers benefit from lower costs and higher machine availability. The solution’s new technologies also open up new business opportunities, e.g. within the scope of smart maintenance contracts. By means of these two examples, Rittal provides insight into tomorrow’s Industry 4.0 world, and the new business models these will enable. And all this potential stems from the seamless transmission of data from sensors inside the cooling units and chillers to the cloud. For more information, visit www.rittal.com. lighting in the news |europe Jerry Appelt, who is almost a fixture at the Eurovision Song Contest. In 2011 in Düsseldorf and 2012 in Baku he was already lighting designer of the Final shows. In addition, in 2013 he designed the lighting for the Junior ESC in Kiev and in 2014 he took over the lighting design for the preliminary German voting for the ESC — just to name the most recent ESC appearances. The new GLP GT-1 hybrids, of which Jerry Appelt had specified a total of 52 pieces in his design, were extremely prominent and always in camera shot. “This lamp takes care of everything — design, performance, output and features,” enthused Appelt about the GT-1. “It’s the whole package that’s impressive: beam, spot and wash all combined in such a compact footprint. Thanks to its slim design and the absence of the classic base, the GT-1 can be perfectly integrated into a set without having to conceal the lamp. For this, it is just seems too good, and with the new light source I do not have to worry about reliability issues. “In fact, we did not have a single problem with the GT-1 from the first set-up day to the last minute of the show,” adds the lighting designer, who has been specifying GLP’s spot and wash lights for many years. Equipped with a 440 watt discharge lamp, the GT-1 offers a unique zoom range of 3.5 to 56.7 degrees — equivalent to an impressive 22: 1 zoom ratio. This hybrid spotlight also features a CMY colour mixing system plus an additional colour wheel, eight rotating and 14 fixed gobos, a high-speed shutter and three rotating prisms. The GT-1 is fitted with an auto-sensing power supply, and an internal battery makes the programming and addressing of the GT-1 possible remotely from the network. The compact baseless design completes the feature set of a lightweight fixture weighing just 25kg. In conclusion Jerry Appelt is unconditionally positive: “We produced a great live show with great looks and we were completely satisfied. The GT-1 continues to be a realistic option for me.” For more information, visit www.glp.de. said, my main consideration when choosing the rig was ensuring that it could colour mix, frame and make as little noise as possible”. Mike drew on a mixture of ETC Revolutions, Martin MAC TW1s, ETC Source Fours and Philips Vari*Lite VL3500Q Spots for his rig. He also added additional house lighting within the Trafalgar in order to further the fresh feeling of the performance. The show has now opened and will run until July 22nd. Mike adds: “I’ve had a great time working on this revival alongside the warm staff at Trafalgar, particularly Michael Corcoran who is the venue’s Head of Lighting. I am also grateful, as ever, to WL for providing top quality service once again and supplying brilliant equipment in record time”. For more information, visit www.whitelight.ltd.uk. n display in the famous Harrods windows till May 10, 2017 Sandrino the Butcher is the first Art-Design project by Visionnaire, conceived by the designer Alessandro La Spada. The capsule collection results from the lively imagination of La Spada and underlies a tribute to the work of his grandfather, a butcher and restaurant owner whose daily gestures have been transposed into a series of Art-Design pieces: the kitchen tools - cleavers, knives and hooks for hanging meat have been released from their original functionality to become eclectic creations of pure aesthetic beauty. The Steak stool features an original seat in red lacquered steel, anchored to a slaughter hook made in cast brass with galvanic golden finish. Three knives in different shapes support the seat. The top of Never on Sunday console is made of red jasper with natural veins. A series of decorations and irregular chains in cast brass with golden finishes end with hooks, hatchets and knives. The feet of the console recall the ancient meat tenderizers. An elegant lamp with red lampshade is hanged on the mirror, broken by a golden cleaver which has been stuck exactly to its middle - hence the name Cleaver Mirror. The symbolic launch of the kitchen tool generates tens of cracks, gently backlit with LED for a more scenic effect. For more information, visit www.marblepress.com. ambert & Fils will be flying to Italy in April for its first appearance at Euroluce, the lighting biennial hosted by Salone Internazionale del Mobile in Milan, two exclusive collaborations will be unveiled : one with Quebec designer Guillaume Sasseville, and the other with Parisian gallery Armel Soyer. Lambert & Fils not only embodies the Made in Montréal spirit perfectly, but has also managed to become, in just a few short years, an important figure in lighting on the international design scene. The studio is thrilled to also have been selected for The Visit, an in-situ installation curated by renowned duo Studiopepe. The Visit’s chosen pieces will be exhibited in an apartment of the Brera Design District, where journalists and tradespeople will discover the best in contemporary design, staged in a unique way. Laurent 11: an exclusive edition for Armel Soyer The Laurent collection has had a very good run since it launched in 2016. After a warm welcome at New York City’s ICFF last May and at the Biennale Intérieur in Kortrijk, Belgium, in October, Laurent won an Interior Design Magazine’s Best of Year Award for lighting and was mentioned among the 10 Best Product Designs of the Year in Azure Magazine. This astonishing journey will continue in Milan. Not only will the whole collection be presented at Euroluce, but Lambert & Fils will also reveal the majestic Laurent 11, numbered and exclusively created for the design and decorative arts gallery Armel Soyer. Located in Paris (with a branch in the Alps), Armel Soyer showcases the work of innovative designers and artists sharing a common quest for quality, inspiration, rarity and exception. Revisiting the classic Bauhaus shape of the opaline hand-blown glass sphere, Laurent offers a variation on minimalist surfaces and volumes, with delicate spheres shining against the rigid nature of its anchors. For more information, visit www.lambertetfils.com. esign Days Dubai, held under the patronage of HH Sheikh Hamdan bin Mohammed bin Rashid Al Maktoum, Crown Prince of Dubai, and in partnership with Dubai Culture & Arts Authority, closed its sixth edition on Friday 17 March reporting its most successful edition to date having attracted both the largest number of exhibiting design galleries and studios and a 10% year-on-year increase in visitor attendance. with more than 400 purchasable works – from furniture and lighting to decorative objects –displayed. Design Days Dubai (est 2012) is the only international collectible design fair in the Middle East and South Asia and one of Dubai’s most-loved cultural events. The annual event presents a diverse cross-section of some of the world’s most exciting highly-collectible design and installations, alongside a talks and workshop programme bursting with leading design personalities and industry experts. Among the fair’s visitors, Design Days Dubai welcomed HH Sheikh Mohammed bin Rashid Al Maktoum, Vice President and Prime Minister of the UAE and Ruler of Dubai; HE Sheikh Nahyan bin Mubarak Al Nahyan, UAE Minister of Culture and Knowledge Development; along with many local, regional and international dignitaries. Design Days Dubai management cited the fair’s new location of d3, the heart of Dubai’s creative industries, and refreshed layout and most extensive programme of talks and workshops as contributing factors to its high level of visitors. Returning to the fair for its fifth consecutive year, Jill Hoyle, manager of Tashkeel said: “As always, Design Days Dubai was a great experience for Tashkeel and provided us with an amazing opportunity to showcase the work of the emerging designers who had been part of the Tanween programme over the last year. The opportunity to show their work alongside that of established regional and international designers and to get feedback directly from visitors to the fair is an invaluable experience for designers at this stage of their career. Design Days Dubai remains a catalyst to the development of the design community in the UAE and region and supports initiatives that focus on regional talent. These include partnerships with Van Cleef &Arpels (the fifth edition of Van Cleef & Arpel’s Middle East Emergent Designer Prize), Audi (Audi Innovation Award), art and design organisaton Tashkeel (the fourth season of Tashkeel’s successful design programme, Tanween), and Dubai Culture and d3 (the third Urban Commissions competition). Mohammad Saeed Al Shehhi, Chief Operating Officer of d3, Design Days Dubai’s new location commented: “We are extremely delighted to have hosted Design Days Dubai for the first time at Dubai Design District highlighting Dubai as a central and strategic meeting point for the local and international design community and firmly placing d3 as the centre for design in the Middle East, on a global level. Collaboration with events such as Design Days is key to our vision of ensuring that d3 continues to evolve into a truly integrated and global creative community, which nurtures and showcases the region’s local talent to an international audience. We are really excited to see the way the region’s design industry is flourishing through platforms like Design Days that supports our vision of nurturing local and regional talent and supporting them to reach their full potential.” For more information, visit www.designdaysdubai.ae. Returning in its tenth edition, the upcoming Build Eco Xpo (BEX) Asia 2017 will be held at Marina Bay Sands Expo and Convention Centre Singapore from 12 to 14 September. In celebration of BEX Asia’s decade -long journey in inspiring greener transformation among the building community across Southeast Asia, BEX Asia 2017 has lined up these exciting changes: the new Smar t Solutions feature area; Technology-powered personalized recommendations and business meetings; as well as the launch of our online learning resource center, all of which are underpinned by a refreshed logo and theme. Convegno Expocomfor t (MCE) Asia 2017, a co-located exhibition focusing on energy-efficient HVAC, Water and Solar Energy solutions. Pavilions representing Canada, China, Japan, Korea, Taiwan and more will also bring together an inspiring showcase of the most cutting edge technologies and capabilities from each market. To advance fur ther k nowledge exchange, BEX Asia 2017 will once again offer the Green View seminar, a complimentar y platform which brings together the brightest minds internationally to share their insights on latest trends and oppor tunities in Southeast Asia, actionable best practices and innovative solutions for building management in the tropics. More updates on other activities celebrating BEX Asia’s 10th year anniversar y will be announced in the lead up to the event. Suppor ted by prominent industr y organisations like the Building and Construction Authority of Singapore and the Singapore Green Building Council, BEX Asia 2017 is one of the anchor trade events of the Singapore Green Building Week (SGBW ). BEX Asia 2017 will be held alongside the third edition of MCE Asia, and the International Green Building Conference (IGBC ). For more information, visit www.bex-asia.com. Thailand Lighting Fair 2017 ( THLF 2017) brings world class lighting technologies and links the “entire lighting buying chain” of global and ASEAN lighting industr y With the continued strength of economy of Thailand together with infrastructure development plan and business-friendly regulations, Messe Frankfur t see great potential in Thailand as a business hub for ASEAN. Good proof would be a success stor y of Thailand Lighting Fair, a lighting trade exhibition, which has been launched in 2015 and now the show has become a leading lighting technology in ASEAN. This year Messe Frankfur t together with The Exhibiz launch “building zone” – to follow light + building show theme as well as bring back Secutech Thailand 2017 in which the organiser strongly believes that the timing is right and the market condition is right. Messe Frankfur t in collaboration with The Exhibiz and continuous suppor t from the Provincial Electricity Authority (PEA) officially announced the third consecutive year of its ‘ Thailand Lighting Fair 2017’ ( THLF 2017). Due to the positive feedbacks of THLF 2016 and in response to industr y 4.0, THLF 2017 will be organised in concurrent with Secutech Thailand 2017 under the main theme of “Smar t City. Safe City.”. ASEAN Architecture & Lighting Design Conference 2017, and series of international seminars and cer tificate courses – Live at THLF 2017. Why THLF2017 •	One of the Lighting Series trade shows by Messe Frankfur t, the World’s Leading Exhibition Organizer •	One -stop sourcing marketplace for lighting technology, design and solutions •	Meeting point for architects, lighting designers and lighting professionals •	An excellent educational platform on lighting innovation and design trends •	With strong suppor t from major government bodies and related associations, THLF will become the largest B2B lighting trade fair in ASEAN ASEAN’s Leading Trade Fair on Lighting Technology, Design and Solutions Thailand Lighting Fair 2017, a trusted platform among industr y exper ts, is heating up the industr y with its ambitious to become a per fect network ing platform and marketplace for Southeast Asia. With thousands of latest lighting technologies on display from upstream ser vices to downstream supplies, the show attracts thousands of ASEAN buyers and offers unrivalled business oppor tunities for international sellers to capture ASEAN’s growing lighting industr y and rising needs for energy efficiency. For more information, visit http://thailandlightingfair.com/. New “ Theatre K. Pub” and 13 thematic halls offer unmatched range of products for show-goers This year, the show organisers fur ther broadened the fair ’s product profile in response to the burgeoning demands for the k araoke and theatre markets in China. The new “ Theatre K . Pub” at Y Channel bolstered the product line -up, offering buyers the latest advancements in the sectors of mini and home theatres, customised installations, smar t digital AV and system integration. Mr Hu Liao, Sales Manager from Mian Yang SCR Technology Co Ltd who came for this specific zone, was content with the diverse technologies on display. “ We are here to acquire the latest market trends in the k araoke sector to apply in our engineering projects for mini theatres, private clubhouses and resor ts. This zone is an accurate reflection of the current market and provides more defined product categories that facilitate our sourcing experience.” O ther visitors were also happy with the number of exquisite brands presented in the 13 thematic halls and zones, including the Audio Brand Name Halls, Pro Audio Halls, Lighting Halls, K T V Hall, Enping Microphone Hall, together with the lighting zone at Y Channel and product zones for conference and PA systems, headphones as well as microphones. show review Mr Jaime Welton, Technical Director of Wukesong Arena (Beijing), who shared his insights on the safety of live events, also asser ted the impor tance of the training course. “As China is one of the fastest growing markets in the world, this show presents a per fect platform for us to initiate safety awareness and preach safety practices among manufacturers and professionals. We are ver y glad to be here.” Mr Hongbing Hua, General Manager of Guangzhou Shituo Liheng Audio Technology who attended the Guangzhou Recording and Multimedia Technology Forum 2017, praised the effectiveness and relevance of the content. “As a company work ing for cinema engineering and stage sound reinforcement, we are often faced with challenges in presenting the best sounds at live events. I’ve benefited greatly from the forum through understanding how the location of microphones can affect the optimal sound output. The quality of the programme is improving, and it ’s good to hear relevant and practical tips from professional speakers.” The highly-rated Vision X Network continued to offer a business platform that facilitated business and technology exchange in a relaxing setting. Mr Ziqian Chen, Technical Manager from Sennheiser Electronic (Beijing) Co Ltd who spoke at the event for the first time, was delighted by the oppor tunity to directly engage with the company ’s clients. “ This is an excellent platform for us to give an in-depth introduction of our latest XSW1 and XSW2 series. This event is more than a product presentation as we can also interact and share technical k nowledge with par ticipants. I am happy to see that many attendees expressed genuine interest and stayed to enquire about the recording solutions of our products.” Par ticipants who visited the Outdoor Line Array, which featured 30 local and international brands across three demonstration areas, also applauded the high quality of speakers. One of the attendees Mr Xiaoyu Guan, Deputy General Manager of Beijing Goharston Technology Co Ltd exclaimed, “I really enjoyed listening and comparing the sound quality of speakers here. The overall quality is ver y high this year, and I can visit the desired booths directly after the demonstration to learn more about their technologies, which saves a lot of my time and effor t.” A number of technology- oriented forums and seminars were also well-attended by exper t speakers and attendees representing various facets of the pro audio and lighting world. These events include the Audio Engineering Design and New Acoustic Technology, Audio Technology Forum 2017, Audio Technology in Digital Age – Development and Oppor tunities, China Mini Theatre and K T V Industr y Forum 2017 (Guangzhou Section) & Outstanding Mini Theatre and K T V Brand Award Presentation Ceremony, Guangdong Association of Per forming Ar ts Meeting (Per formance Venues), as well as Practical Measurement for Pro Audio Equipment. Together, they provided industr y peers with business ideas, network ing oppor tunities and market insights. For more information, visit www.prolightsound-guangzhou.com. Thailand recording double -digit increases – bringing more business oppor tunities for exhibitors.” Mr Chau noted that a fairground sur vey indicated that the industr y was optimistic about the lighting market ’s outlook for the coming year, with expectations of persistent demand for smar t lighting and substantial growth in LED and green lighting sectors. A new “Smar t Lighting & Solutions” zone was introduced this year to showcase the latest smar t lighting systems, remote controls and products, while “LED and Green Lighting” remained the fair ’s largest thematic zone, attracting more than 450 suppliers. These zones offered quality products catering to the latest market needs. The HK TDC commissioned the independent on-site sur vey during the fair, inter viewing more than 373 exhibitors and buyers about their views regarding industr y prospects. The sur vey found that 95 per cent of respondents expect overall sales of products to increase or remain unchanged this year, up 31 percentage points from last year. drive development of the lighting industr y in the next two years. The highest growth potential is seen in household lighting systems that can be controlled by smar t phone/tablet applications, and in smar t lighting systems primarily with energy-saving purposes for household/industrial/commercial applications. As for product trends, respondents consider lighting accessories, par ts & components to be the product sector with the highest growth (38%), followed by LED & green lighting (18%), household lighting (18%) and smar t lighting & solutions (9%). Among traditional markets, respondents are most optimistic about Nor th America, Western Europe and Hong Kong. As for emerging markets, respondents believe the Chinese mainland, ASEAN countries, the Middle East and Latin America have the best growth prospects this year. “Smar t lighting is favoured by the new generation in GCC (Gulf Cooperation Council) countries because young people like novelty and they can use mobile apps to control lighting effects and achieve home automation,” said Muhammed Noufel, General Manager of Bella Nova Trading FZE. The buyer from the United Arab Emirates also said his company had identified many new suppliers through the fair, and planned to buy US$50,000-100,000 wor th of LED lighting products from them. hotel lighting products from the Chinese mainland and Vietnam. Mrs Cabrera said she plans to buy US$500,000 wor th of lighting products from these new suppliers and would soon confirm orders with the hotel lighting suppliers. Highly Effective Marketing and Sourcing Platform Mable Fang, Lighting Consultant for Epistar Industrial (Hong Kong) Co Ltd – an exhibitor which has joined the fair for many years – said the show was an impor tant platform to promote the company among international buyers and to look for new prospects. “ We have received enquiries from many buyers including those from Europe, the Middle East, Southeast Asia and the US. We expect that at least two to three new buyers will buy our products,” she said. Argentine buyer Fernando Pache Brussoni, Director of Urulamp, appreciated the scale of this year ’s Spring Lighting Fair. “ The LED industr y is developing quick ly. The fair brings together a lot of suppliers and new products, which allows us to grasp the latest trends. So far, we have found new models of flood lights and street lights, and already identified four to five new suppliers from the Chinese mainland. We’ll buy their products after check ing their quality and prices,” he said. For more information, visit www.hktdc.com/aboutus. In the past 20 years, the Guangzhou International Lighting Exhibition (GILE) has been facilitating crossindustry networking for the lighting sector worldwide. Entering its 22nd edition, the fair, known as one of the most comprehensive lighting and LED events in Asia, will be held from 9 – 12 June 2017 at the China Import and Export Fair Complex in Guangzhou, China. The fourday event will welcome more than 2,300 exhibitors from over 20 countries and regions and span 17 halls covering 175,000 sqm of exhibition space. Visitors to the show can expect to source from an extensive range of lighting and LED technology-related products as well as lighting accessories, electronic components and more. Prestigious domestic and international companies confirm their attendance at the 2017 fair The latest innovations in the lighting and LED industries from across the world will be on display at GILE. The exhibition is categorised into three major sections including production, technology and application. By bringing together all key industr y players under one roof, fairgoers will be able to learn about up-to-date lighting and LED trends and news within the entire manufacturing process. Production sector The production segment highlights the latest components used for product development and materials that optimise the durability and per formance of the light and LED products themselves. Some of the well-k nown confirmed components, material and manufacturing equipment suppliers par ticipating in the 2017 fair include AiHua, ALANOD, Almeco, BJB, Dow Corning, EVERFINE, Han’s Laser, Instrument Systems, Inventfine, LEDiL, Niche -tech and many more. With technologies constantly evolving, end users are also demanding better lighting designs that fall into strict budget constraints. To counter high design costs, companies such as Dow Corning, a wholly owned subsidiar y of Dow Chemical, is a global leader in silicones, silicon-based technology and innovation. The company see their products and solutions play an impor tant role in expanding LED lighting designs. They are confident that their advanced silicon-based technology such as chip coatings, LED chip encapsulates and others will optimise light quality, optical efficiency, reliability and overall cost for future LED lighting designs in China as well as other countries and regions. 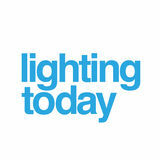 Technology sector Lighting technologies is also another key highlight at the show. A comprehensive selection of power supplies, drivers, electronics, thermal management systems, optical components and others will be on display. Some of the renowned brands specialising in the development of lighting and LED lighting technologies include: ALPHA, Bridgelux, Citizen Electronics, Dialog Semiconductor, Edison, HC SemiTek, Honglitronic, Inventronics, MEAN WELL, MOSO, Power Integrations, Refond, Rfsemi, Seoul Semiconductor, Shineon and many more. With the growing quantities of LED products readily available in today ’s market, consumers not only require efficiency and reliability but also emphasise ‘Quality of Light ’. Returning for the ninth time is Japanese manufacturer, Citizen Electronics, who will display their latest product, the CITILED VIVID Series pack aged LEDs. Using the company ’s latest chromatic LEDs, this series of products is developed to enhance the vivid colour for all items displayed in retail stores, ar t galleries, museums and others. Additionally, the company will also showcase their DIM to WARM COB series at the fair. Application sector Not only have technological advancements enhanced lighting functionality and efficiency, but have also improved on their applications. The fair will put into perspective how residential, commercial and industrial lighting applications paired with modernday urban and architectural designs can influence people’s daily lives. Some of the confirmed exhibitors specialising in this categor y include: Dilux, Everlight, Feelux, Fumagalli, Hpwinner, Huayi Lighting, Luminus, LEDvance MLS, Nationstar, Nexus, OML, Romney, TONS Lightology, Wellmax and many more. Moving beyond the scope of illumination, lighting now plays an impor tant role in enhancing human wellbeing, vision and per formance. Returning exhibitor, Feelux from Korea, will showcase their latest, energy- efficient lighting systems at the 2017 fair. Devoted to providing optimum lighting for various applications, the company ’s products can be found in households, offices, retail stores, healthcare institutions and more. show review Commenting more on the fair ’s business matching programme, Ms Wong added: “GILE captures the pulse of the lighting and LED industries and we are using this as our leverage to strengthen the effectiveness of our business matching ser vice. With end users becoming more conscious towards energy efficient, green and reliable lighting solutions, environmentally friendly products such as compact fluorescent lamps and LED lighting will continue to be one of the spotlights at the show. Equally impor tant for the future of the lighting industr y are smar t lighting solutions which interact with smar t devices via IoT technologies. A comprehensive selection of state -of-the -ar t sensors, on/off controls, dimming and ambient lighting solutions will also be offered.” The Guangzhou International Lighting Exhibition will run concurrently with Guangzhou Electrical Building Technology. Both are a par t of Messe Frankfur t ’s light and building technology fairs worldwide, headed by the biennial Light + Building event which will take place from 18 – 23 March 2018 in Frankfur t, Germany. Messe Frankfur t also offers a series of other light and building technology events worldwide, including the Shanghai International Lighting Fair, BIEL Light + Building in Argentina, Light Middle East in the United Arab Emirates, Interlight Moscow powered by Light + Building in Russia as well as Light India, the LED Expo New Delhi, and the LED Expo Mumbai in India. For more information, visit www.messefrankfur t.com. ANONYâ&#x20AC;&#x2122;s flexible lighting collection can provide both function and ornamentation to almost any space. The pure forms and neutral material palette of the lights allow them to make a quiet statement wherever they may be placed. All fixtures use dimmable LED technology and can be fully disassembled to change the light source, replace a part, or re-install. Here we feature three fixtures â&#x20AC;&#x201C; Dawn, Ohm and Horizon. Dawn | Linear Suspension Light Dimensions: W1220 x D48 x H437mm / W48 x D1.875 x 17in Material: Aluminum, Plexiglass, Acrylic, LED Finish: Anodized Matte Black / Matte WhitePlexi Finish: Smoke Tones Dimmable: ELV Dimmable Dawn is composed of plexiglass panels that gracefully drape over a refined aluminum tube, producing dynamic shapes and subtle shades of colours. As the name suggests, it is a graphic take on the ethereal moment when the sun is rising but still below the horizon, softly illuminating the sky. O hm | Pendant Dimensions: OD125mm / OD4.875in Material: Steel, Aluminum, Glass, LED Glass: Frosted / Matte Opal White Shade Plated Finish: Polished Copper / Brass / Mirror Chrome Shade Painted Finish: Matte White Sandtex / Matte Black Sandtex / Available in various colours upon request Dimmable: ELV Dimmable An innovative take on a conventional sphere, the Ohm’s orbiting shade invites curiosity and interaction. Each opal glass orb casts a warm ambient glow, suspended in space by a slim suspension cable. The Ohm can be displayed as a singular pendant or as a cluster. Horizon | Wall S conce Dimensions: OD250mm x H50mm / OD10in x H2in Material: Aluminum, Polycarbonate, LED Finish: Matte White Sandtex / Available in various colours upon request Mounting: J-Box | Keyhole Plug-in Dimmable: Triac Dimmable Horizon is a minimal disk which appears to float off the wall. A simple push changes the direction of light. The sophisticated construction creates an unbroken ring of light, revealing no fasteners. Horizon can be produced in any colour and arranged in any pattern to create sculptural compositions. Horizon also has an optional wall adapter with an on/off switch, eliminating the need for a junction box as it is powered with a cord and plug. About ANONY ANONY is a lighting and product design studio founded by Christian Lo and David R yan in 2015. Lo and R yan’s refined design aesthetic belies the complexity of factors they consider as part of their creative process. Their interest in utilizing the latest technology and manufacturing processes is combined with an honest and timeless approach to a product’s life cycle judicious use of materials, minimal manufacturing, and ease of use. Through this philosophy, ANONY hopes to create products that produce an emotional response similar to the appreciation felt for the utilitarian yet well-designed objects of decades past. Their first lighting collection, launched at the Interior Design Show Toronto 2017, won ‘Best Collection’ in the Studio North exhibit. For more information, visit www.anony.ca. Popup lighting is a light fixture inspired by popup books. The idea was to turn every day icons into artistic and elegant lamps. The clean shape of the lamp is amplified by the light's reflection on the wall, creating a 'wow effect' and making the ambiance in the room magical. Bringing back that excitement and naivety we felt when we opened our first popup book. The Inspiration When Chen Bikovski was a child she loved popup books, "they had the ability to take me into a world of fantasy and magic that always inspired my dreams. Each time I flipped a page I was sent down the rabbit hole, and just like Alice in Wonderland, I discovered a new fantasy world hidden in the ordinary looking book â&#x20AC;&#x201C; the surprise making the magic all the more real." Growing up, those feelings of magic and fantasy were getting harder and harder to find. That's why she created Popup Lighting. She always felt that there was something magical about light, so, with this passion for art and design she has created a light fixture that would bring those nostalgic feelings of magic, excitement and innocence back into everyday lives and by doing so, allow to share them with friends and loved ones. The Deer Head The Deer Head lamp is a wall-mounted light fixture that can be used to light a multitude of spaces. It's a classic, nostalgic wall piece given a contemporary and sophisticated interpretation. When lit, the Deer Head lamp creates a magical ambience. It is perfect for any situation; romantic moments in intimate spaces or magical fantasy in a child's bedroom. The gold aluminium deer head is a decorative lamp, made of painted, folded aluminium and steel. It is 39CM long x 35.5CM when switched off. When lights are on, it becomes 75cm x 70 cm of light and brilliancy. About The Brand 'Popup Lighting' is a young Tel Avivian company lead by Chen Bikovski and Sarig Shinar, specializing in lighting fixtures under the concept of lighting transforming into different fixtures in an artful way. Popup Lighting was made to bring a unique ambience to any space. The game of light and space turns the lamp into a work of art, painting itself all over again every time it's lit. W ith a simple flip of the switch, beams of light turn into brush strokes turning the lamp into a work of art that dramatically changes the atmosphere, setting the mood and sparking the imagination. For more information, visit popuplighting.com. he Internet of Things (IoT) is the network of physical objects, devices, vehicles, buildings and other items embedded with electronics, software, sensors, and network connectivity, which enables these objects to collect and exchange data. The IoT allows objects to be sensed and controlled remotely across network infrastructure, creating opportunities for improved efficiency, accuracy and economic benefit. Each thing is uniquely identifiable through its embedded computing system but can interoperate within the existing Internet infrastructure. The IoT is directly related to applications such as smart grids, intelligent transportation and smart cities. Schreder Owlet IoT City Management System, which is based on Open Standards, can interact with larger smart city platforms. Owlet IoT is not only a high performing remote lighting management system, it can also exchange data or interoperate with neighboring systems such as traffic management sensors, environmental monitoring systems or security devices. One of the fundamentals of IoT (Internet of Things) is that the devices intended to be connected to a larger network communication platform have to be addressable’ in a similar way. The structure of the address which is attributed to this latest generation of luminaire controllers managed by Owlet IoT is called IPv6. This method of addressing devices can generate an almost unlimited number of unique combinations to connect non-traditional components to the Internet or computer network. Owlet IoT is not a standalone `silo type’ system, but future oriented and open to 3rd party integration. EASY SET-UP Thanks to the combination of an built-in GPS antenna and an intelligent auto-commissioning process, it is a real Plug and Play solution. SMART HYBRID ARCHITECTURE The heart of the system is the full hybrid concept which provides the best of both worlds. It consists of a strong local mesh network between the luminaires and the sensors and a robust backhaul communication with the system servers. COMPATIBLE WITH SENSORS Different types of sensors like PIR and radars are connected directly to the luminaire controller. Switching the light levels from the lower `idle’ state to the higher `event’ state during the night, increases the visual performance as well as the level of comfort while maintaining or even increasing the potential energy reduction. INSTANT GPS LOCATION A built-in GPS accurately locates the luminaire position. This feature simplifies the set-up and commissioning process to a large extent. It also detects location changes e.g. following maintenance. EFFICIENT ASSET The Owlet IoT luminaire controller incorporates a unique feature to capture the characteristics of the lighting scheme. This data and the precise luminaire position provided by the GPS feature determine the luminaire light profile for the given location. smart lighting PLUG-AND-PLAY LUMINAIRE CONTROLLER The Owlet IoT luminaire controller is based on the 7 pin NEMA socket. The node can be easily plugged in and replaced without any tools. PRECISE ENERGY CONSUMPTION MEASUREMENT The nodes incorporate a built-in utility grade energy meter that offers the highest metering accuracy available on the market today (<1% for the complete dimming range). SAFE FALL-BACK SCENARIOS As safety for all is the primary objective, multiple technologies ensure that the system is switched on and off in complete security. INTUITIVE USER INTERFACE The Graphical User Interface (GUI) was developed with the latest web-based application tools. Every user can organize his/her dashboard in such a way that the most relevant topics or parameters appear first. OPERATIONAL BENEFITS One of the unique assets of this dynamic lighting management system is its capacity to implement, adapt and reproduce lighting profiles and driver settings, which are typical for public lighting networks. Thanks to Schréder’s experience and indepth expertise as an outdoor lighting specialist, the Owlet IoT system provides extended operational features which simplify maintenance. LWS Lighting Solutions (LED WORLD’s project Department) Project Manager Mr.Shanil Basheer comments “We were approached by the Hotel’s Project Department head to entirely plan the basic design for their external facade lighting as well as illuminating the backyard coffee shop. Our lighting designers, engineers, closely worked with Harrison Consultants to lay down each archaic detail for rendering a gleaming display for the hotel during the nights. We supplied an array of products from neon flex lights with RGB controllers, Façade linear wall washers, spike lights, in-ground lights and double asymmetric washers, LED digital screen, LED festoon bulbs, outdoor spot lights and down lights. We mounted LED Strips with opal diffuser along the facade projection at bottom and top columns to create a halo effect. Linear LEDs were floor mounted against the wall uplighting the internal space visible through the plant room louvers. Strip lights were laid underside of the soffit above the terrace area for a floating effect. We installed Spikes LED uplights to illuminate the flags at the entrance, in-ground LED lights to illuminate the main car entrance. The backyard cafĂŠ was illuminated with festoon white cable lights with golf bulb lamps hung loosely from the pergola structure. Trees were draped with Fairy light wraps and spike uplights, LED downlighters were installed for column planting and planter illumination. The cafeteria walls were embellished with black wall mounted spot lights while the edges were laced with color changing RGB Led strip lights that are adjustable.â&#x20AC;? for staff whilst boasting a bright and attractive lighting for a spectacular view.” Steigenberger Hotel Business Bay, Dubai, Celebrated their First Anniversary in Style as it picks up Two Prestigious Awards. It won the award for the Hotel Lighting Project of the Year at the Light Middle East Awards 2016 and also the Best Luxury Business Hotel in the UAE award at the World Luxury Hotel Awards. The hotel also picked up the Leading New Hotel award at the Leaders in Hospitality Awards 2016. For more information, visit www.ledworld.ae. local cultural per formances including trade fair for the neighborhood products. In 2012-2014, L&E had a chance to be a par t to create works of ar t in a form of temporar y lighting installation for this festival. L&E was assigned to design and create the works in many feature areas along the river, for example, Kian Un Keng Shrine area, Santa Cruz Church water front pavilion, Wat Prayoonwongsawat water front pavilion, etc. These buildings and areas were lit with different concepts to convey and communicate the stories of each place and the believes of each religion. The selection of the colors of light, lighting effect and various lighting techniques could draw people in, created atmosphere and ver y much impressed the visitors. The concept of lighting design for each year is different- this ar ticle elaborates L&E’s work in 2012 in details as follows: Wat Prayoonwongsawat Waterfront Pavilion Since the pavilion is the transition space where visitors must pass through to Wat Prayoon, RGB Color Mixing technique is then used to add interest by illuminating 3 colors of light from different directions. When there is nobody walks pass the area, the lights will combine to white light, but when there are people passing, there will be various colors of shadows. There is also a hidden meaning in Buddhism in these lights about contemplation, discretion and selflessness. Santa Cruz Church Waterfront Pavilion The lighting design at this area demonstrates a chapter from the bible about â&#x20AC;&#x2DC;the magic star â&#x20AC;&#x2122;, which is the star that leads the philosophers to Jesus. The nighttime sky blue color lighting is used to illuminate the pavilion, coupled with the sparkling lighting effect of stars from the reflection of the mirror balls. There is also an effect of reflective light on the walkway as a leading light to the church, by using the reflection of the mirrors that are placed intermittently. In addition, there is also a handmade gobo projection in rose window shape of the church lit up at the ceiling of the pavilion, which is how lighting unifies the place together. Kian Un Keng Shrine The lighting design at this area is done by using red color, which is an auspicious color from Chinese beliefs to cover up the shrine. Red conveys light, warmth, strength and glor y, while the dragon sculpture is lit with white light to stand out as the Chinese considers that dragon is a symbol of strength, power and mightiness. Moreover, the trees in the shrine compound are fully decorated with orange-color globe lights, which are made of table tennis balls with LED illuminated inside. These are the metaphor of ‘orange’, which rhymes with Chinese word meaning luckiness or auspiciousness. ■ About L&E L&E is a lighting equipment manufacturer and lighting solution provider based in Bangkok, Thailand. We have been specialists in lighting for more than 20 years and engaged in many prominent projects in Thailand and other Asian countries. For more information, please visit www.lighting.co.th. ochi Racecourse star ted holding its night races ( Yosakoi Night Races) from July 2009. The racecourse put night-race equipment in place due to the current continued deployment and enhancement of internet infrastructure, and also due to a strong desire to have horseracing fans from all over Japan“ enjoy Kochi Racecourse even more.” In the spirit of “ giving back to the fans who visit,” Kochi Racecourse changed its night-race lighting to brighter and more -visible LED lights, and also introduced a membership system enabling cashless purchasing of betting tickets. The objective for the change to LED night-race lighting was a reduction in power consumption, and after various testing, 830W highoutput LED floodlights were selected. The existing 283 units of 1500W multi-metal lamps were upgraded to 240 units of 830W LEDioc FLOOD DUELL lights, leading to an overall reduction in power consumption of roughly 40%. The previous level of brightness has been preser ved while reducing the amount of equipment, and the initial brightness compensation function has enabled maintaining a constant design brightness from the time of initial installation until the end of the lighting’s operating life. 830W LEDioc FLOOD DUELL lights installed on top of the roof light the straight stretch before the winning post. The exciting scenes on the straight stretch before the winning post are illuminated with 830W LEDioc FLOOD DUELL lights in a bright and easily visible lighting environment. n for thcoming years, the University of Montréal, one of the city ’s major institutions, will be opening a second campus located on a former railway yard. Existing tracks had to be relocated in order to accommodate the new facilities and a new viaduct was built over the campus’ future access road. The site was dug to allow the underpass, then bermed up slightly to accommodate the 24-metre steel bridge structure. The reinforced concrete abutments extend into zigzagging retaining walls, creating a dynamic mineral landscape. The 44-metre guardrails on either side of the viaduct were made in four sections: they are steel-framed assemblages backed by per forated steel plaques, coated with metalized paint. The diagonal steel plates recall the triangulated motif of more traditional truss bridges. A similar motif was developed for the protective railings along the sidewalks below. The viaduct ’s unique signature transforms it into a subtle landmark on the campus Facing the campus, the viaduct acts as a backdrop that comes to life at night when four light ‘tableaux ’, inspired by Sol LeWitt ’s Wall Drawings, appear and disappear in the dark. These, generated by 135 LED light bars inser ted on the diagonal grid of the west guardrail, are programmed to produce ephemeral patterns in constant movement. The chosen theme for this vir tual animation is that of the four seasons: drops of rain, followed by snowflakes, allude to the fall and winter seasons; creepers announce the spring and fireflies celebrate the summer. assessing the shor tlist in depth, the judges were unanimous in their admiration for this project, which they considered a standout winner for successfully expressing a design philosophy that treated colour as a key consideration throughout. The brief for this new school building included a variety of general learning areas, provision for the senior year teachers and a science centre. The circular shaped plan had an appropriate civic quality based on the school’s original masterplan. However, rather repeating the circular pattern inside, the designers chose to use geometr y and colour to define the central cour tyards, light wells and learning spaces. The sharp angles and vivid colours of the interior form a dramatic contrast with the round form and muted tones of the drum-like outer structure. At key entr y points, the drum is ‘eroded’ to reveal the wonders of science and learning expressed through this vibrant design. Per was delighted by the surprise of the coloured inner spaces as revealed through these openings, and went on to say : “I think that what fascinates me - and what makes it a winner - is that this project is obviously about colour from the star t.” The designers were inspired by the idea of an eggshell hiding an inner core, and by k aleidoscopes, where a view inside reveals seemingly infinite combinations of colour and pattern. K aren appreciated this approach, saying: “I t does look like an egg and when you break it open, there’s this jewel of colours in the middle. here are many ways to express a brand; I t could be a monotonous expression, or a diversified presentation. I t is similar to magazine in this regard. A magazine has an unified tonality and values, it star ts contact with readers through different contents, but a brand connects to clients through different products. I t â&#x20AC;&#x2122;s logicality, upgrade ability, and continuity have something in common. Magmode is a brand that combines works of many designers, thus a unified concept is needed to express the logicality of the whole brand. In the design of Magmode, RIGI hopes to build a new concept in the terminal: a three -dimensional magazine, a readable store. RIGI defines different areas of the space as different sectors of a magazine. The shop signage is the cover of a brand, and there is a content of the newest seasonal designs at the entrance. Ever y display area is defined as different pages, which presents different contents in the space just like a magazine does. The concept of regular updates could be seen ever ywhere. The background wall of the brand is defined as brief seasonal introduction of the magazine. The whole design forms a unified concept; a unified multi-element. is also home to the Much Music broadcasting studio, The Canadian Opera House and the National Ballet of Canada. Upon entering the Restaurant patrons are greeted by a statuesque tree. The trunk is of a fallen Ironwood tree resurrected from the floor of a Southern Ontario forest and treated with the ancient Japanese process of Shou Sugi Ban, a technique in which wood is preser ved through carbonization rendering it matte black. The treeâ&#x20AC;&#x2122;s canopy floats effor tlessly above with a rhythmic gesture inspired by the natural phenomenon of murmuration. This gestural expression is presented in geometric form using 3-D printed technology. Reaching the wood trellised ceiling above, the ar t piece titled Fuga, defines the entrance from the new bar area adjacent and introduces the anticipated drama fur ther into the new space. Chef Lee felt the original bar area lacked energy and connection to the rest of the dining space and the urban nature of the neighbourhood. +tongtong utilizes 2 large scale elements that now connects the bar to the street and the dining room while maintaining defined and differentiated spaces. A reflective black ceiling stretches the length of the room overhead, deep and mysterious, the inver ted pond offers an aerial view of dining room activity. A 43ft glass rail separates the new bar and dining room. Laminated within the glass +tongtong created an abstract graphic mirror of a beehive and bees collecting honey. A layer of dichroic film renders the sur face iridescent â&#x20AC;&#x153;like the wings of butter fliesâ&#x20AC;? says +tongtong Principal John Tong. The par tition doubles as a mirror that reflects the street life into the bar area and a per forated screen maintaining transparency to the dining room. Another feature link ing the two areas is a custom-designed wine display back lit and framed behind a glass wall. Columns of voluptuous vegetable -tanned and oiled leather saddles gently cradle bottles of wine. The effect resembles young buds clinging to vines showcasing Chef Leeâ&#x20AC;&#x2122;s vast wine offerings. eading law firm Corrs Chambers Westgar th’s new Melbourne office is located over five floors from levels 22-26 in the innovative and unique centerpiece building at 567 Collins Street. Corrs’ Reception is situated on the 25th floor, with spectacular views over Melbourne’s skyline from the floor to ceiling glazing. The feature staircase rises through the central void, link ing reception with classic but contemporar y mixed-use casual dining areas. Electrolight were appointed to provide a lighting scheme to realise Corrs’ vision of a sophisticated and timeless aesthetic, with a focus on the Reception Void and casual enter taining areas. Adding to this the primar y consultation spaces, including fifteen meeting and boardrooms, unite Corrs’ inter face and consultation offering. Reception The steel rods that span from ceiling to floor framing the stair of the ten meter high void are flanked with linear LED with acute optics to provide focused lighting to the stair and primar y circulation space below. During the daylight hours the south facing Reception Void on level 25 and casual enter taining areas on level 26 receive significant amounts of natural light. Ar tificial lighting was a key component in allowing the core lift lobbies, meeting rooms and corridors to connect with the natural light flow throughout the tenancy. spatial envelopes Corridor The sk illed team at Bates Smar t Architects meticulously pieced together elegant spaces and finishes with a multitude of refined detailing. Electrolight had to ensure that intrusions were minimised amongst the clean, sleek lines and subtle folded forms. A deep level of planning and coordination between Bates Smar t and Electrolight was necessar y for light placement, concealment and per formance. About Electrolight Electrolight is a design studio dedicated to mak ing a difference through light. Dining Room Feature Pendant The feature pendants in the casual enter taining area are a bespoke solution that was designed to complement the architectural forms and finishes. Electrolight believes that light has the power to change lives. Regulating bodies, fuelling emotions and inspiring the soul. They are intrinsically fascinated by the way in which one sees and experiences the world. Central to that is vision – and by definition – light. The super-compact casing (97x43x30mm) of VosslohSchwabe’s new LED drivers facilitates flexible luminaire design in downlights and spotlights attached to mounting rails used for office and shop lighting purposes. These drivers achieve optimum lighting quality thanks to their low output ripple current (<5%), assessed in accordance with Institute of Electrical and Electronic Engineers (IEEE) 1789-2015 standards. And their flexibility is further increased by the adjustable output current, which can be set either by terminal selection or via the standardized LED Set interface. •	Output: max. 17 – 45 W, 300 – 1050 mA •	Highly efficient: >90% under full load •	Service life: up to 100,000 hours •	Product warranty: 5 years For more information, visit www.vossloh-schwabe.com or contact your local VS sales representative. Professional LED High Mast Light By YAHAM Optoelectronics Co., Ltd www.yahamlighting.com As a professional LED industrial lighting designer and manufacturer, YAHAM provides professional and efficient large area lighting solutions for global customers. The latest Compact S and Lumiway 3 series LED High Mast Light receive great attention because of the high efficacy, high stability and excellent suitability. Lumiway 3 series Lumiway 3 adopts minimalist design but still has high performance. 60°×90°, 80°×150°, and 85°×150° optional light distribution provides more professional large area lighting; Integrated heat sink, rapid thermal dissipation. •	300W/400W/600W/900W available •	Light Efficacy up to 110lm/W •	Luminaire lumens up to 99,000lm •	Beam angle: 60°×90° (80°×150°, 85°×150°optional) •	Protection rating: IP 65 •	5 years warranty Types of Application •	Stadium like football field, tennis court, golf course, etc. •	Harbor and dock •	Intersection and overpass bridge •	Airport •	Square For more information, visit www.yahamlighting.com. EYE Super High Power LED Floodlight LEDioc FLR-L By EYE Lighting www.eye.co.jp Using Iwasaki Optical Control (LEDioc) technology, Iwasaki Electric Co Ltd was able to develop a state of art super high power COB LED floodlight with super narrow beam angle of 5 deg. W ith the advance LED technology and optical control technology, Iwasaki Electric Co ltd look set to replace conventional 2000w metal halide floodlight. Features: •	Available wattages: 310w, 560w, 830w, 1100w,1300w •	Beam angle: 5°, 8°,12°,15°,24° •	Available either in High efficacy (up to 110lm/w) or high CRI (>80) •	Design with compact size to replace conventional 2000w short arc metal halide floodlight •	Built in initial compensation function (constant lumen output over life) enable immediate power saving. •	Flicker free high definition TV broadcast electronic circuit power supply •	40,000hrs @L85 For more information, visit www.eye.co.jp . Supernova Chandelier was born from the cataclysmic explosion of a massive star – the instant of a bright star burst that was suspended into a fascinating lighting design. Supernovas can briefly outshine entire galaxies and radiate more energy than our sun will in its entire lifetime. The suspended brass particles of Supernova Chandelier will offer you a timeless, brightest and magnificent setting. The Drop pendant lamp from GrayPants helps prove that even the most simplistic shapes can be beautiful. The Drop lamp takes the shape of a drop of water, forever just about to fall. Constructed of high-quality recycled cardboard, the Drop Lamp only gets more interesting the more you look at it. The highly detailed accents of the cardboard feature distinctive wave patterns created by the corrugated layers, with ripple patterns handcrafted upon it too. A twin pack of decorative bluebells to add colour and height to your borders, these hand painted flowers are lit by white LEDs for a soft, magical glow. A fantastic way to ensure that your garden is in full bloom all year round, these decorative stake lights make a stunning garden decoration. A 1950s feature 'Eagle Alusig' converted traffic light mounted on a wooden surveyors tripod. A salvaged American traffic light, with a polished aluminium enclosure, original hood and cast manufacturer's detailing and branding on the rear. A new etched glass diffusion screen provides a nice diffusion of light when the product is lit. Designed entirely in aluminum and cast aluminum, the Savelys light fixture is a design that matches colours particularly well: The blue-grey shade, with the white on the inside, mixed with the silver colour on the top part of the lamp and the power cable that is braided in black fabric. These sober colors blend perfectly together.